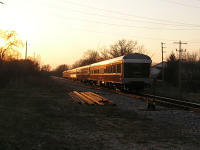 Wisconsin & Southern Railroad runs its HM train between Horicon and Milwaukee daily, Monday through Friday, and returns to Horicon as the MH. 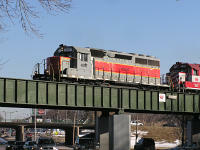 Normally, the HM doesn't make it all the way to North Milwaukee, instead dropping cars off for the ML (Milwaukee Local) and Union Pacific's Granville Job at Granville, beneath the Brown Deer Road bridge just west of 107th Street in the northwest corner of Milwaukee. 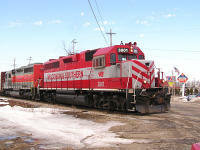 When traffic is heavier, however, the train does go all the way to the North Milwauke yard. 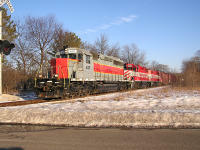 In my wandering around Milwaukeeland one cold February morning, I came to Donges Bay Road and spotted a train heading my way. 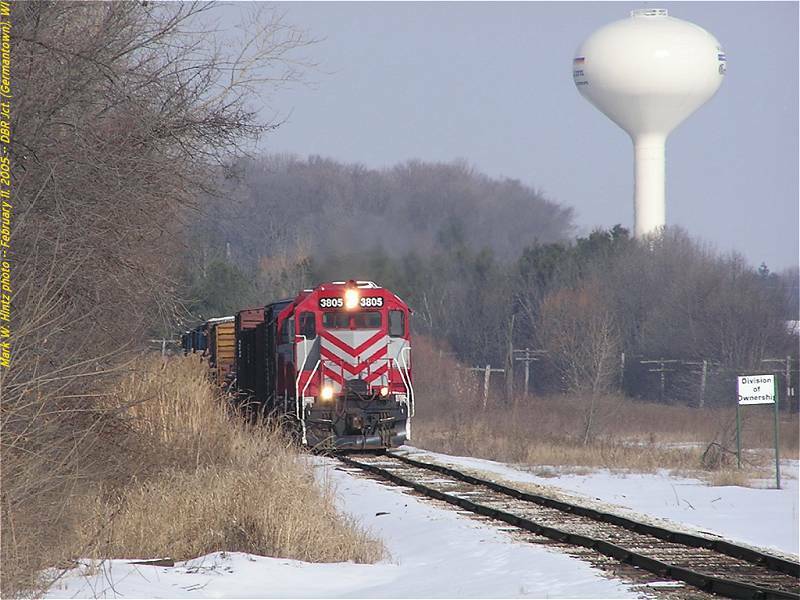 I pulled out the camera and got a few shots, and decided to chase the train, getting a few more shots in the northeast corner of Menomonee Falls before catching up with the train at Granville. 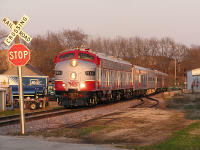 After watching the exchange of cars at Granville, I once again went to the Menomonee Falls triangle for a parting shot before saying goodbye to the MH11. 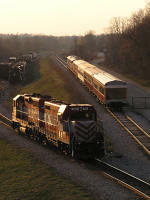 On August 19, 2005, after getting pictures of UP 1988, I chased WSOR's MH up to Menomonee Falls and Germantown. On October 19, I found the HM at Ackerville and chased it as far as Germantown! This outing proved to be a learning experience, as I tried out a few settings on my camera that I didn't know about before! Some of my photos from this trip turned out especially well, and I really like the picture at Richfield! As a result of my previous two successful HM/MH chases on the 19th, I planned on again chasing the HM on December 19, and I made the offer for anyone to join me. One brave soul, Paul, took me up on the offer, and after breakfast at The Sawmill in Richfield, we headed north to try to find the train, which we did at Hartford. It was a very cold day, and we both needed the heat of our refuge, the car, to keep fingers and toes from freezing. The crew could have used a little more refuge, too, since the frigid Wisconsin conditions resulted in several losses of the brake air, as well as some problems with the power switches across the CN/WC at Slinger. 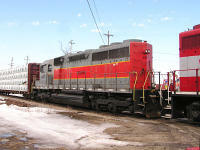 Paul finally gave up the chase after we waited at Slinger for a while, but I picked up again at Ackerville, this time getting a different vantage point, a crew change (making the HM an HMR), and a CN/WC train that snuck up on me. I finally gave up the chase in Germantown, where it appeared that the train had again dumped the air, but all in all it was a worthwhile day. 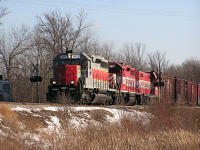 Rich Peters and I made plans to meet up for some railfanning on the day after Christmas, and after not finding much at either UP Mitchell or CP Muskego, we decided to head to North Milwaukee. This proved to be a good idea, since we spotted WSOR 4077, one of WSOR's most recent roster additions, getting recrewed for the trip back to Horicon. 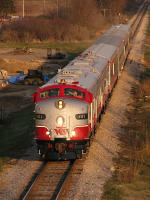 MilwBeerNut got some information for me regarding a "dinner train" that would be running from North Milwaukee to Oshkosh, featuring the debut run of WSOR E9A 101 in her new configuration. Debbie and I made it a "baby-free afternoon", and spent most of the afternoon scoping out and chasing the Special, as well as informing a few other railfans as to the train and its destination. 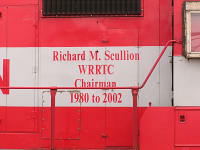 WSOR ran a special train for the Transportation Research Board on August 21, from the Milwaukee Intermodal Terminal (Amtrak Station) to Horicon. 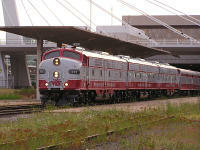 The trip featured the debut of WSOR's recently-resurrected E9B unit, pieced together from a former Michigan Northern power car (the B-unit "shell") and a former MARC E9A unit (the "guts"). 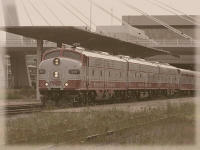 Along the way, the TRB got to experience Canadian Pacific's mainline to Duplainville, Canadian National's mainline to Slinger, and WSOR's own mainline — mostly still jointed rail — to Horicon.